← Pink Hot Chocolate? Raspberry Romance or Strawberry Sweetheart! WARNING: this may be addictive! 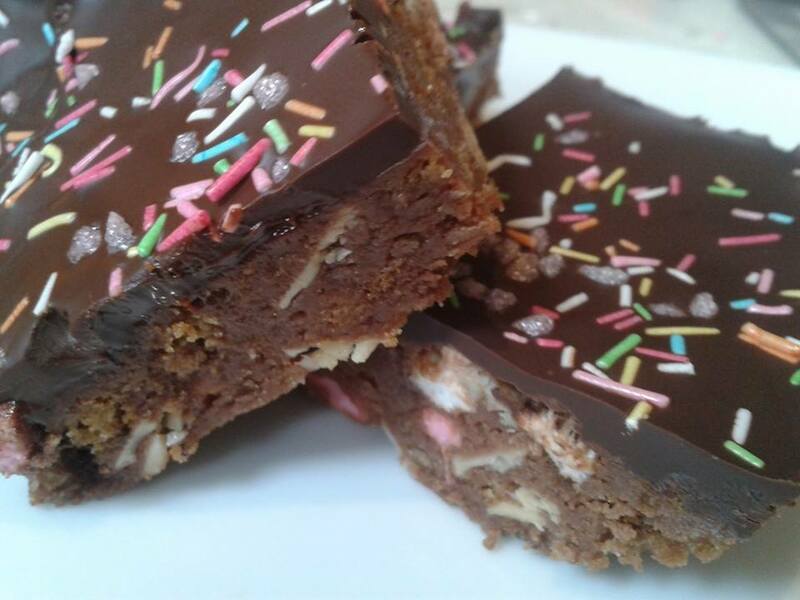 The basic ingredients are the same although I think if you add raisins & then cover the bar with chocolate you have a Tiffin, if there are marshmallows in it it’s a Rocky Road anything else is a Fridge Cake. As long as it tastes good, who cares?! 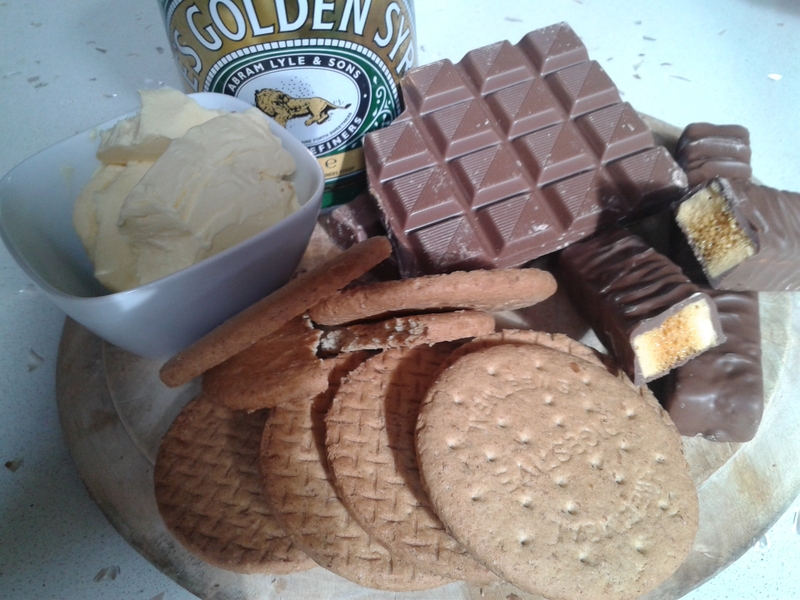 Put 125g Digestive Biscuits into a deep bowl and bash with a rolling-pin. You don’t want the biscuits to be completely powdery but at the same time you don’t want the chunks to be too large as it will make the finished bar harder to cut. Mix in any other ingredients such as raisins/marshmallows/nuts/dried fruit, I would recommend doing this by sight as everyone has their own personal preferences. Put 100g Butter, 2tbsp Golden Syrup into saucepan on a gentle heat until melted & bubbling. Remove from the heat & stir in 200g Milk Chocolate (broken into pieces) and stir constantly until the chocolate has all melted evenly. 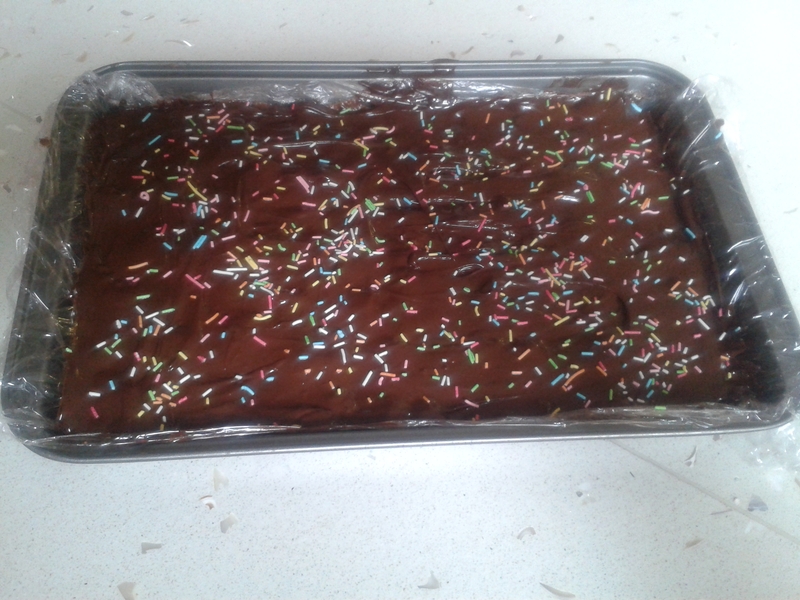 Pour the chocolate mixture into the dry ingredients and mix together thoroughly until completely combined. Spoon it into the tin, smooth the top & place in the fridge. 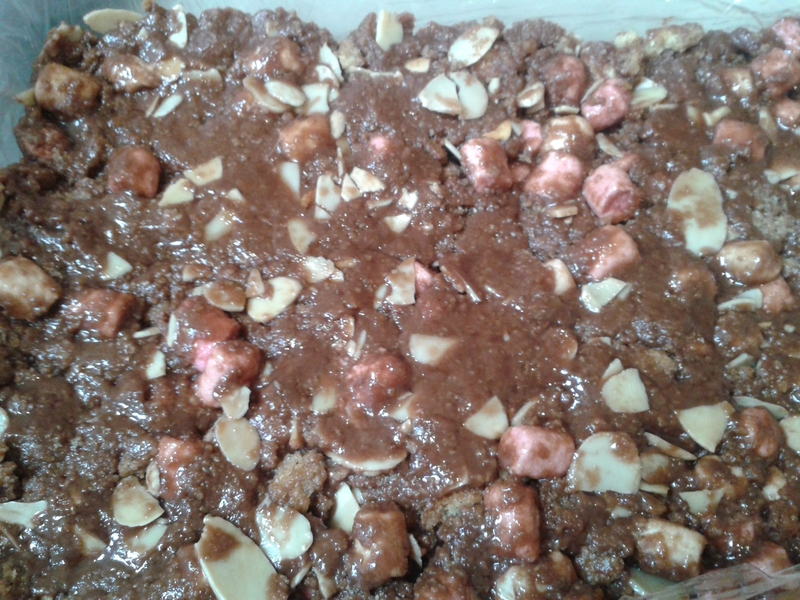 For my version, I crushed 2 Crunchie Bars with the biscuits for a honeycomb flavor and then threw in a handful of White & Pink Marshmallows. I then melted 200g Dark Chocolate with a small knob of Butter in a bain-marie (bowl resting above a pan of simmering water – make sure the bottom of the bowl does NOT touch the water) and spread it all over my cooling bar. A few Sprinkles later & back in the fridge to set for an hour or two. I like the thick chocolate layer on top and use dark chocolate only because I find that more milk chocolate makes it a bit too sweet. Just try not to eat it all in one go! 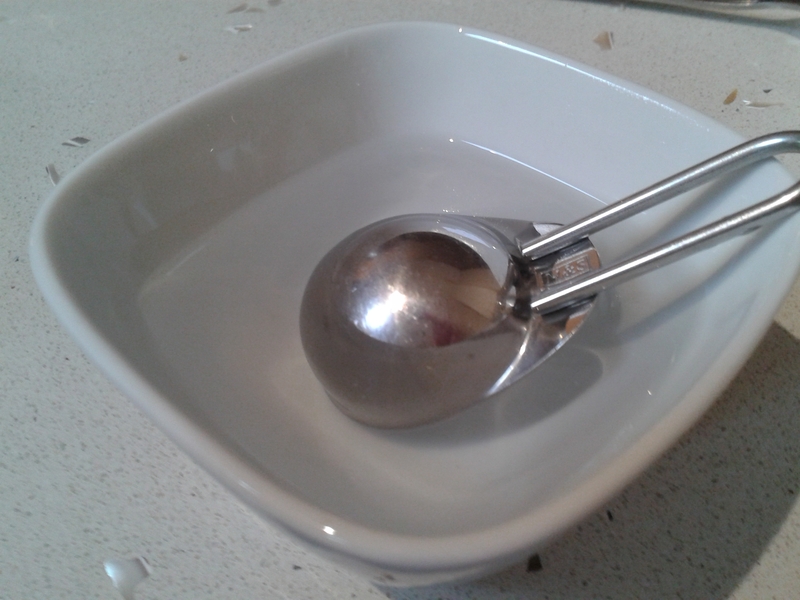 TOP TIP: Always have a small bowl of boiling hot water to dip your measuring spoon into when using Golden Syrup. A hot spoon will release the syrup more easily ensuring you get an accurate measure.